The ConnectingOntario ClinicalViewer is a secure, provincial electronic health record (EHR) system that allows Ontario clinicians, and authorized members of their health care teams, to access their residents’/patients’ personal health information (e.g. lab results, diagnostic imaging reports, discharge summaries, details of a prior visit to the emergency or other department). Access to the viewer is restricted to those who provide or assist with resident/patient care. The program is funded and overseen by eHealth Ontario. For more information on the ConnectingOntario program please visit: www.ConnectingOntario.ca. St. Joseph’s Continuing Care Centre is a viewing organization and will provide its health care providers with access to the provincial EHR through the ConnectingOntario ClinicalViewer. 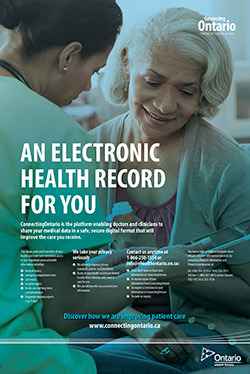 St. Joseph’s Continuing Care Centre, along with all other organizations participating in the ConnectingOntario program, must follow all applicable health privacy laws (including the Personal Health Information and Protection Act, 2004) as well as the EHR privacy policies and procedures. You have the right to block access to your personal health record in the viewer by placing a consent directive (often referred to as a lock-box). It is best to discuss the implications of placing a consent directive with a member of the treatment team. Please note that a consent directive may be overridden with your express consent, or in other circumstances as permitted by law. For more information, please contact our Information and Privacy Office at 613-933-6040 ext. 21179 or privacy@sjccc.ca. You have the right to request copies of your health records contained in the viewer or request that your record be corrected if you believe it contains an error. For access or correction requests in the EHR, please refer to the eHealth Ontario website here . For privacy-related inquiries and complaints about St. Joseph’s Continuing Care Centre’s participation in the ConnectingOntario program, please contact our Information and Privacy Office at 613-933-6040 ext. 21179 or privacy@sjccc.ca . For all other inquiries and complaints about the EHR program or the viewer, please refer to the eHealth Ontario website here .